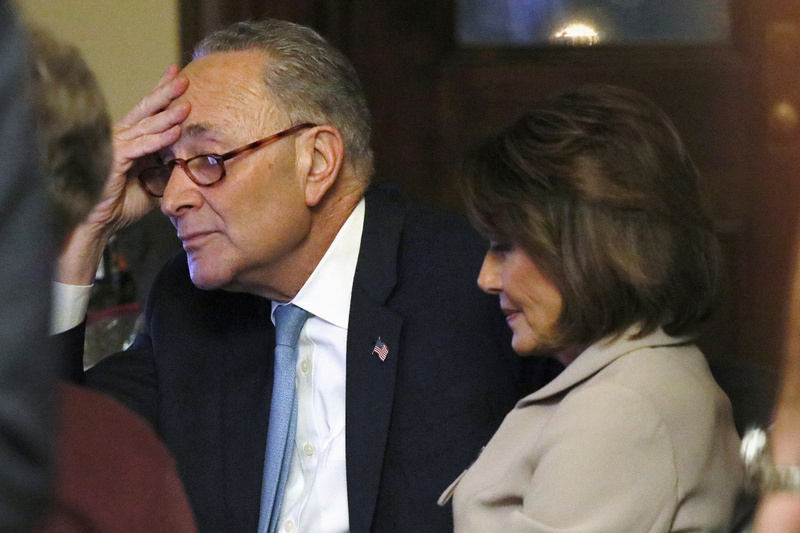 Speaker of the House Nancy Pelosi and Senate Minority Leader Chuck Schumer gave the official Democratic Party response to President Donald Trump’s remarks Tuesday night. Other Democrats, like New York Rep. Alexandria Ocasio-Cortez and Vermont Sen. Bernie Sanders, appeared on cable or streaming platforms to share their thoughts as well. The responses all differed regarding what the Democratic Party’s priorities should be. Ocasio-Cortez went as far as to question whether ICE should be funded at all, while Schumer and Pelosi stressed the need for border security. While the media has focused on the official Democratic Party response to President Donald Trump’s Oval Office remarks given by House Speaker Nancy Pelosi and Senate Minority Leader Chuck Schumer, two other prominent lawmakers on the left shared their thoughts in what further emphasized a party being pulled in separate directions. Though not televised, Sen. Bernie Sanders live streamed his own nine-minute reply to the president on various social media platforms. In his speech, the self-proclaimed socialist and failed presidential candidate contrasted the priorities of Trump with what he saw as the most dire issues facing the country like climate change. Sanders also dismissed the idea of a crisis on the southern border as “artificial” and one of the president’s own making. Throughout his remarks, one never got the impression that Sanders believes immigration security should be a remote concern for members of Congress. Yet Democratic Party leaders like Schumer and Pelosi chose to focus on the largest problem at hand, namely the government shutdown. Both leaders emphasized the need for border security, choosing to highlight the supposed ineffectiveness of a wall over more modern security solutions. Issues like climate change, student debt, or health care coverage, all touched on by Sanders, were never mentioned by either Schumer or Pelosi. Freshman Democratic Rep. Alexandria Ocasio-Cortez also appeared on MSNBC shortly following her bosses’ remarks in what could not have been a more clear break from her party’s official line. Whereas Schumer and Pelosi both wanted to make clear to the American people that their party takes border security seriously, Ocasio-Cortez questioned whether the federal government should be funding U.S. Immigration and Customs Enforcement at all. Through these three responses, Americans see a Democratic Party struggling to find a coherent counter-message to the president. Whereas Schumer and Pelosi, solidly representing the establishment wing, focused on process and compromise, Sanders and Ocasio-Cortez represented how the Democratic base is slowly starting to speak for the whole party. In their responses, Ocasio-Cortez and Sanders not only criticized the president, but questioned the priorities of Congress, akin to an implicit attack on Democratic leadership as well. Congressional Republicans may break with the president over funding for the wall, but Democrats in Washington are already breaking on the entire party’s future legislative agenda.